Events of the landmark night for East Leeds March 14/151941 when Richmond Hill School was bombed is remembered by Barbara Blakeney (nee Reynard) and Betty Nevard (nee Gibbins) Eric Sanderson winds the entry up with a humorous finale. At a recent East Leeds Reunion I spoke to Mrs Barbara Blackeny (Barbara) Her amazing memory can take us right back to the ‘blitz’ and that iconic night for East Leeds of the 14/15 th March 1941 when bombs hit our Richmond Hill School and the next morning the pupils of Richmond Hill School were transferred to other local school – mainly Ellerby Lane School or evacuation out of the city to places of greater safety. 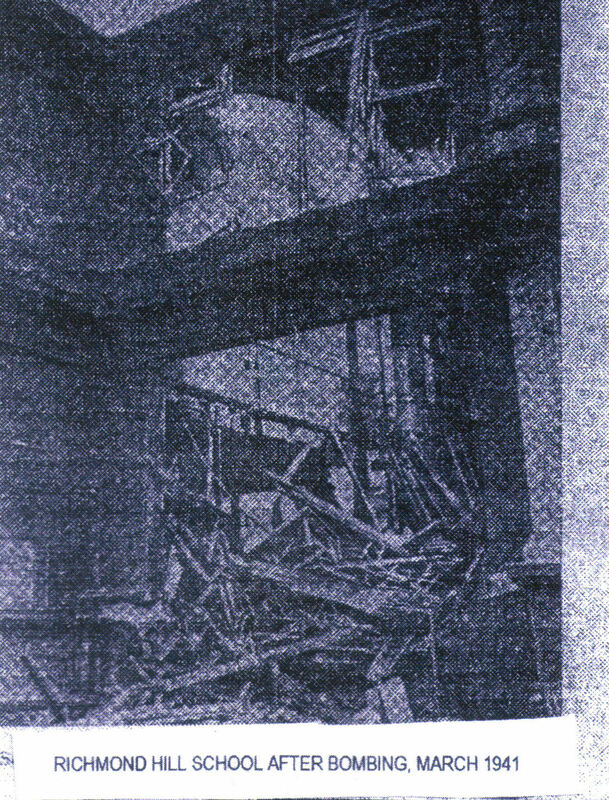 Betty Nevard, another of our contributors who has a story on the site was actually a pupil at Richmond Hill School says the bombing brought to an end her time as a school girl there she includes a picture of her classroom that took a direct hit. As it was though the night the school was empty and there was no loss of life. The next morning I visited the site, we girls were knitting socks and Balaclavas for the troops and remember seeing my knitting amongst the rubble my efforts looked so pitiful a khaki Balaclava on broken blue knitting pins I recall the same air raid resulted in the dropping of bombs on Butterfield Street. From then until I left school at the age of fourteen years of age I attended Ellerby Lane School. Brian Monk who lived just off Lavender Walk remembers that night of the bombs the blast blew a sleeper right out of the deep railway cutting that hit the gable end of their house. Afterwards his dad cut it up and made part of it into an air raid shelter. Another of the stick of bombs hit the Woodpecker pub. Note: as a result of bombing in Leeds 77 people died (65 on the night of the 14th March), 327 injured 197 buildings destroyed and a further 7,623 damaged. I remember the night Richmond Hill School and Butterfield Street were bombed during the blitz of 14/15 March 1941. My dad used to be a fire watcher and was based at Wardle’s in Butterfield Street at the top end going into Lavender Walk. Wardle’s did stabling and the business included hiring out carriages and horse drawn hearses. Dad was in World War One so he was too old for war service in 1939. Fortunately he was not on duty in Butterflied Street the night of the bombing. Many streets had their own fire watching equipment. St Hilda’s Mount where I lived included. The equipment consisted of: ladders buckets, stirrup pumps, shovels and sand, all to deal with incendiary bombs. Drills were often organised but no incendiary bombs were ever dropped in our street. There was a club to witch residents contributed three pence per week towards their cost at the end of the war when I was about twelve the residue of the money provided a street party and each child received a brass three penny bit. Tables chairs and benches and believe it or not pianos were carried out of people’s homes into the street and a bonfire was lit. I have one of the old stirrup pumps but the rubber tubing perished years ago. I have some shrapnel too from the blitz part of an exploding shell probably fired from the guns at Knostrop. St Hilda’s School was closed at the beginning of the war and some children and their mothers were evacuated to Ackworth School near Pontefract. I don’t know when they all returned but my cousin, Eunice Johnson and I were taken to Lincolnshire to stay with my grandmother’s relations in the small village of Swinstead twelve miles from Grantham and nine miles from Bourne, We arrived there on Sunday 3rd of September (The day war broke out) and only stayed there until the end of January 1940. I think we were home sick. Other childhood memories are of the pleasure we had walking or cycling down Red Road to the lovely blue bell woods near Temple Newsam Golf Course and up to the mansion or down Black Road to have a paddle in the Wyke Beck at Red Walls. Sometimes we cycled further afield to Leventhorpe Hall and then onto Swillington; my weren’t we in the country! Seeing the billets where the German POWs were and the big guns at Knostrop in the encampment during the war, it was another world away. Eddie and Edna Pawson lived in a farm down black road and at the side of the farm was a derelict little cottage that Edna professed had a ghost to try and frighten us. Nowadays places like that would be out of bounds due to health and safety, there was no compensation culture then. I must have been about three and a half when I saw a German airship flying over the Copperfields in a north westerly direction . From reports it was June 1936 when I started in the babies’ class at St Hilda’s School under a Miss Williamson. Until I was nearly four we had to sleep in the afternoons in camp beds with a blanket over us ( I remember those camp beds too but I could never get to sleep it seemed unnatural) There was a flat sheet with corner ties underneath which our mothers had to take home and wash every weekend. Miss Powell had standards one and two Miss Duckworth standards three and four and Miss Fewster standards four and five. Letters sent to the newspapers are often a huge & important source of local information, often reflecting the metrics of the time. These might include comments on local affairs, complaints, compliments , information, responses to others & in fact, almost any other reason you can think of. A tongue in cheek selection of a few from the archives might just jog a few memories about the matters which occupied our minds at the time. Thank goodness the war’s over but when can we expect rationing to end now that we don’t have to send all that food to our troops overseas? It’s like giving foreign aid when we’re skint ourselves & I don’t wish to sound ungrateful to our glorious soldiers but why can’t they scrounge it from those ungrateful Frogs? My war time pre-fab is damp & draughty in spite of stuffing old newspapers into all the gaps. What can I do to get out of this hellhole? & quite frankly, tastes like it too. It’s so cold, it nearly fractured my dentures. I hope this isn’t a sign of things to come. We get hundreds of letters on this subject but don’t worry, it’s a passing fad. I feel confident we’ll not see the end of our Tetley’s, Melbourne’s, John Smiths, Ramsdens etc. They’ll be with us for years to come , just as will our local pubs. They’re part of our heritage & will never disappear. Why are our libraries devoid of any serious literature? All I see on the shelves are fictional thrillers, romantic novels & rows & rows about someone called Harry Nutter. Where can I find Proust, Nietzsche, Kafke, Solzenhitsyn, or even Tolstoy? You must be one in 10 billion who has a clue what any of those are on about and where each page doesn’t feel like having a pre frontal lobotomy. Letters to the Editor continue to this day, providing a window on current & locals affairs, giving a public voice to anyone who cares to participate & long may it continue. Although the foregoing are obviously the (spoiled?) fruit of a tortured mind, some of the themes do reflect what were, & still are, concerns for some, then and now. This entry was posted on February 1, 2019 at 12:15 am and is filed under East Leeds. You can follow any responses to this entry through the RSS 2.0 feed. You can leave a response, or trackback from your own site. Thank you Barbara, Betty, and Eric for the reminders of those old days. My classroom at Richmond Hill School was on the ground floor and on the northern side of the building and so was not hit directly. But a coat lobby (is that what they were called in those days?) had been designated as our air-raid shelter and it had been completely demolished. No child or teacher in my class would have survived had the bombing occurred during school hours. Sadly, the big kids had just finished a fund-raising drive and had financed a new stage in the upstairs hall. The result of all their efforts was destroyed. The bombing attacks were probably deliberately aimed at the main railway lines to northern England which passed under the big-kids playground. My big brother spent the last 6-months of his elementary-school education helping to shift chairs and desks etc down to Ellerby Lane. WOW Doug! I didn’t know you attended Richmond Hill School as well as Ellerby Lane and The Central High School. You are primary source material. It’s a good job the Germans normally only bombed by night if you had been in that cloak room you wouldn’t have been here to tell the tale. I heard those bombs dropping from the safety of our shelter in the garden. When I called for my paper this morning I found myself relating my tale to the guy in the paper shop but how can a person in his thirties ever imagine that we got bombed by the Germans? It’s another life time isn’t it? A remarkable story Barbara , your recollections & experiences , especially of evacuation, have created a truly indelible memory of those times. I also recollect (just) the March 14/15 of 1941 bombing of Leeds when around 40 bombers attempted to demolish Kirkstall P.S. ; Kirkstall forge ; Marsh Lane sidings & other strategic targets. They dropped incendiary bombs to light the way but missed the main targets yet did much collateral damage to buildings with death & injuries as you mention in your story. I remember my Mother telling me on the night of the 14th, we were in a neighbours air raid shelter, the men who were not away, went out, at much danger to themselves, with dustbin lids to quell the incendiary flares , probably intended to target Neville Hill railway workshops. Incidentally, my school at the time (Victoria), had a couple of very solid brick built air raid shelters which stood for some time after the war & were often used as challenges to go into an unlit, damp smelly place if you dared. Thanks Barbara and Betty, I can recall my Grandma talking about the bombing of Richmond Hill School and Butterfield Street, she lived in Ascot Street and I was born in Devon Street, so we were quite close to that area, but I was only 2 years old in March 1941 and I can’t recall the event occurring, so thank you, your account of what happened together with Doug’s comments paint the picture. Thank goodness it happened outside of school hours. I seem to recall my Gran saying one of the bombs didn’t explode that fell in Butterfield Street. but I don’t know that for sure. Thank you Eric for your imaginary letters to the Editor, and I must agree some of the points made are still concerns today, I like the one about the Supermarkets being a flash in the pan, where I live, we have at least seven major supermarkets, the much loved high street corner shops have almost disappeared..
Hi Eddie – I believe you now live in the Crossgates/ Austhorpe area , one which I knew very well & you’re correct , it’s changed almost beyond recognition. I remember Station Rd with it’s shops, cottages & the single lane bridge just before you reached the Ritz cinema. St Theresa’s church is still there of course & thriving I believe. Austhorpe Rd with shops well on towards Manston Park. The Regal Cinema ( very classy) at the tram terminus with Coe’s chippy opposite near the old police station . Then there was the well attended library at the end of Farm Rd with a couple more shops on the other corner (one was pharmacy as I remember). Now everything is dominated by the Arndale Ctr & the big supermarket next to the Station pub. The old Travellers pub on the corner of Austhorpe Rd is long gone, as has it’s replacement which stood alongside the Regal between Cross Gate Lane & the Ring Rd. I used to go to the old one summer Sunday lunchtimes with my father & uncles to sit in the well kept beer garden behind the pub. So yes , it has changed a lot but I must say, the Arndale Ctr is now pretty good in itself & has benefitted from a facelift & better variety of units. AND , you can still get a good pork pie at Wilson’s ! I go to Cross Gates usually once a week. I park near the Leodis Pub. If it’s a nice day I walk up Primrose lane and across Primrose Valley – you can still get across even thought they are building a million houses there. If it’s raining I just walk directly to the centre.In either case I get a pie from Wilson’s and go and eat it on Manston park. Two crows always seem to turn up for the crumbs. If it’s raining there is a little gazebo where you can sit under cover. Then I come back through the centre and have a browse around the Pound Shop, there is still one there, have another sit down in the centre and return along the road to the Leodis – a couple of hours well spent. It’s years since I’ve been in Primrose Valley but I might make that a reminiscence walk for this spring/summer. Into the valley & across the railway footbridge to the footpath running behind Cross Gates School to where it runs into the junction of the Bridle Path & Bridle Path Rd (now Maryfield Av) , round into Poole Rd & Farm Rd (where my Mother used to live , near the library) , & back into the ctr. Hi Eric, yes I live in Crossgates area, I have done through many of the changes you mention, you brought back some great memories of how it used to be. I’ve always had relatives living in the area even when we lived in Devon Street, my Mum’s eldest Sister lived at No. 2 Pool Road, and when we were young we’d have sleep overs at her house. I joined the Crossgates Library the early 1940’s, and I still use it now. The fantastic thing is the decor is exactly the same as I remember it all those years ago. Sounds like a great reminiscence walk through Primrose Valley, hope it’s not changed too much, but there seems to have been a lot of development in that area in recent years, and you can’t do better than a Wilson’s Pork Pie to round it off..
My Mum was also an enthusiastic user of the library. She lived nearby in Farm Court for the last 15 years of her life but still frequently used it even when she lived over near the Devon pub. She would easily get through a couple of books a week but never got around to using the internet facility. So it’s good it has retained most of it’s original décor & the exterior certainly hasn’t changed as I remember it from over 70 years ago. 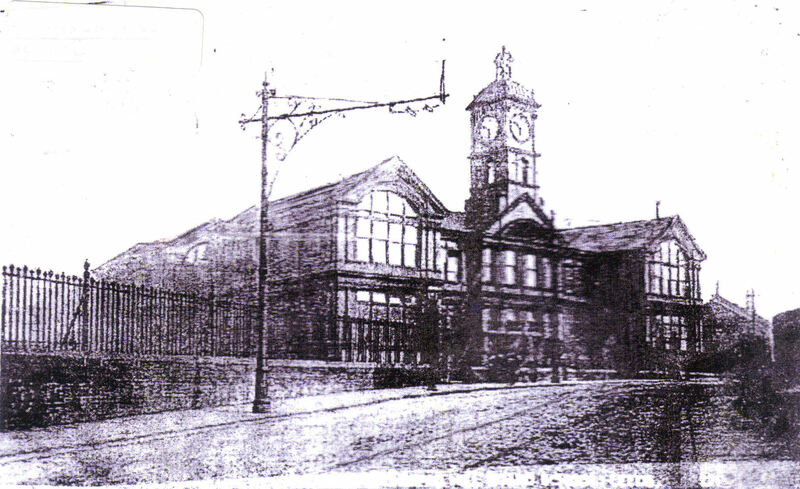 My father went to Cross Gates school in Poole Rd & I also had relatives that lived on there before moving to Garforth. One set of my Grandparents lived on Bridle Path Rd opposite what was a small wooded area at the East end of the Bridle Path.So you can see I have long standing connections with the area , having roamed all over it from being a young lad & to this day , I retain fond memories although I no longer have reason to visit other than an occasional nostalgia journey. You are lucky to live there. Thanks for you memories about Cross Gates Eric and Eddie. And that your dad went to Cross Gates School. On my sojourns to Manston Park where Cross Gates School played their home games I am reminded of a time when our little school, St Hilda’s Cross Green played Cross Gates, a much larger school, in the Schools Cup We drew one – one on our Snake Lane pitch and had to play the replay on Manston Park I sit behind one of the goal posts there eating my Wilson’s pie and remember the game as it was yesterday although it was 1950, nearly seventy years ago. Our goalie, Dave Pearson did not have proper football boots so he played in a pair of black working men’s boots with bulbous toe caps, he went out bouncing the ball from his hands (they don’t even have to bounce the ball now do they?) he kicked the ball out of his hands straight back over his own head into the goal and I was standing on the line and managed to head it away for a corner, I still rib him about it if I see him even today. We managed to win the game three-two. Often I’m tempted to tell my tale to passers by while I’m seated on that form behind the goalposts eating my pie but my special memory usually falls on stony ground. A nice reminiscence.Pete. Cross Gates school did have a formidable football record. I can remember playing them in a season where we (Victoria) finished League Champions & double cup (Samuel & Wynne) finalists , winning one. Cross Gates gave us hard games both at home (EEP) & away, Manston Park as you say. They sported a red/white strip I think. Another recollection of Primrose Valley occurred to me. My paternal grand parents lived on the York Rd Sutton estate & there was a footbridge from there over the railway into Primrose Valley. So it was an easy walk for me to cross the bridge, turn left into the Valley & up to the footbridge crossing to the path running behind Cross Gates school. Along the path , into Bridle Path Rd , straight into my maternal grandparents house , opposite the Maryfield Wood.. A fairly short journey which you could also accomplish by bike. Between the two bridges mentioned, there used to be a small area not unlike the Black Rd “basins” , which provided an opportunity for a bit of excitement. I seem to vaguely remember that cycling on the Valley footpath was forbidden, not that it stopped anyone !!. It was a very wide open area in those days but I dread to think of what it’s like today. Great memories, Eric. How is it we remember our school days better than what we had for breakfast? Ref Primrose Valley, I can put your mind at rest about land on the eastern side of the railway – at my last visit that whole area is still untouched and a public park I can’t imagine anyone will be allowed to build houses on there, there are still tennis courts a bowing green and many metaled paths. Just realised Pete, your title for this tale may be a parody on Joan Baez’s song , “The night they drove old Dixie down”.